Representative Tom Anzelc and Senator Tom Saxhaug were formally thanked and recognized during the Grand Rapids Chamber of Commerce “Eggs and Issues” breakfast meeting this morning. The two legislators were present to give a re-cap of the 2014 legislative session to area business leaders, and talking about the various laws and tax changes that happened this session, there was a time for Q&A. 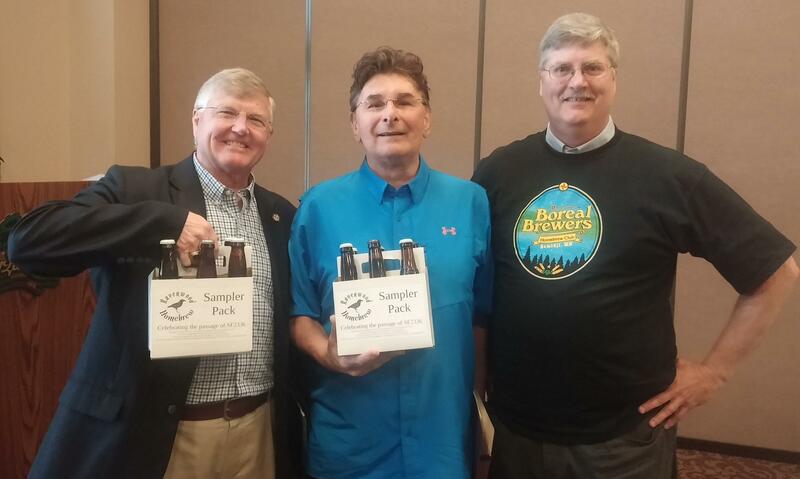 Just before the meeting ended, Chad Haatvedt, a member of the Boreal Brewers Homebrew Club was given an opportunity to present Anzelc and Saxhaug with a six-pack of homebrew. Haatvedt told the folks there about the significance of the new legislation for homebrewers: it allows us to share our craft, legitimizes tastings and competitions and supports community events and fund-raising efforts. He acknowledged the political skill, savvy, and perseverance it took to walk new provisions through the legislative process. ← Governor Dayton Signs Homebrewing Law! The July/August 2014 edition of Zymurgy Magazine’s legislative update article (pp13-14)formally recognized the work of the BorealBrewers Homebrew Club in getting the law changed in Minnesota to be more permissive for tastings, club events, etc. The term 'toddlers' originated in England. There were impurities in the drinking water that disallowed the water to be used for drinking. A common alternative drink was beer (it was cheep, plentiful and the water used to make it was treated during the initial boiling during brewing). Toddlers, just weaning off of mothers milk were unaccustomed to the effects of beer. This coupled with the fact that they were just learning how to walk really made them toddle.